Brynn Thayer shined on the mound. Middleton’s bats came to life. And the Cardinals’ girls softball team had a solid week, winning three of four games. 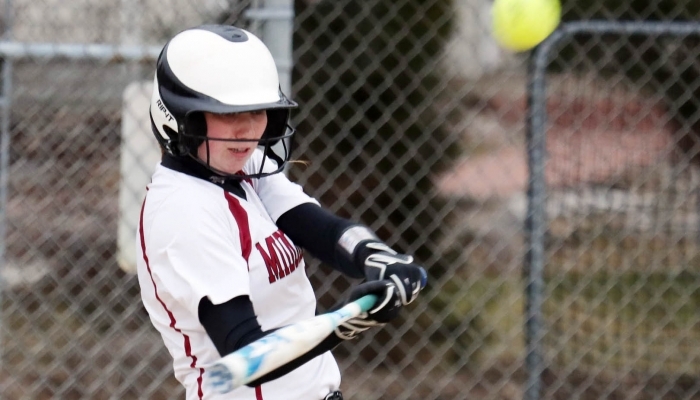 Middleton defeated River Valley, 12-2, on April 1, and downed Madison West, 16-0, in its Big Eight Conference opener on April 2. The Cardinals pounded Madison East, 11-1, on April 3, before falling to Madison Memorial, 5-0, last Saturday. Middleton is now 4-2 overall and 2-1 in the Big Eight. • Middleton 12, River Valley 2 (6) — Brynn Thayer pitched five innings and allowed only four hits and two earned runs. Thayer threw only 65 pitches with 44 for strikes. The game was stopped after six innings due to the 10-run mercy rule. Middleton took a 1-0 lead in the first inning when Ashley Bindl's RBI double to left center scored CC Hiorns, who had reached on an error when she bunted. The Cardinals then took a commanding 6-0 lead thanks to a five-run fifth. Lauren Horst tripled to left center, then Beth Young and Mattie Joers followed with walks. Two outs later, Bindl was hit by a pitch to score Young. Olivia Hebert tripled to the left field wall to clear the bases. Hebert later scores on a wild pitch to make it 6-0. Middleton added three more in the third to make it 9-0. Hebert's two-run double to center was the key hit. The teams didn't play last year, but River Valley beat Middleton in 2016 and 2017. • Middleton 16, Madison West 0 (5) — Thayer and Ellie Buza combined on a two-hit shutout and Bindl had three hits and two RBIs. The game was stopped after five innings due to the mercy rule. In the second inning, Young's two-out single to right scored Hebert and helped stake the Cardinals to a 2-0 lead. In the third inning, Hebert's two-run double scores Jenna Redders, who reached on an error, and Bindl, who doubled to right. Katelyn Graf followed with a double to left to score Hebert, then Williams hit a two-run home run to right center to give Middleton a 7-0 lead. In the fourth, Redders had an RBI double, while Bindl and Williams added RBI singles as Middleton pushed its lead to 7-0. The Cardinals added five more runs in the fifth inning highlighted by Lauren Vander Sanden's hit to the wall in right that scored Bindl. • Middleton 11, Madison East 1 (5) — Hebert and Williams each drove in four runs and Thayer and Buza combined on a three-hitter. The game was stopped after five innings due to the 10-run mercy rule. Middleton struck for four runs in the first inning when Redders doubled to right center, Hiorns bunted for a hit and Bindl walked to load the bases. Redders scored on a passed ball and Hebert followed with a single to left to score Hiorns and Bindl. Hebert scored later in the inning on a Williams groundout to third. In the second inning, Hiorns walked with one out and stole second. After Bindl flied out, Hebert drove in Hiorns with a single to center. Williams singled to score Hebert and Graf followed with a single. Horst then drove in Williams and Graf with a double to the wall in center for an 8-0 lead. Middleton added three more runs in the third inning as Hebert had an RBI single and Williams had a two-run double. Thayer allowed three hits and one earned run in three innings to get the win. Buza didn't allow a runner in two innings and struck out three. • Madison Memorial 5, Middleton 0 — Camryn Decker allowed two hits, walked one and struck out 10 as the Spartans toppled the Cardinals in a game played at Madison College last Saturday. Hibner noted that Decker also pitched well in a 3-1 win by the Cardinals in a WIAA Division 1 regional semifinal a year ago. Decker struck out the first six Middleton batters. The Cardinals only got the leadoff batter on once all game and never had more than two runners on in an inning. Middleton's best chance to score was in the third inning when Young walked with two outs and Redders was hit by a pitch. However, Hiorns struck out to end the threat. Williams doubled to right with two outs in the fourth, but Thayer struck out to end the inning. Hebert singled up the middle to lead off the seventh, but Williams lined out to center on a diving catch by Lily Frisch, pinch-hitter Bailey Flock grounded out to third and Horst grounded out to Decker to end the game. The Spartans scored two runs in the first and added three in the sixth. Hibner noted errors kept both innings alive for Madison Memorial. Pitching (ip-h-er-so-bb): Hoffman (L; 5.1-11-10-3-11), Thayer (W; 5-4-2-6-1), Buza (1-0-0-0-0). Leading hitters: MID — Redders 3x5, Hebert 3x5. 3B: Hebert, Horst (M), Zumbrennen (M), Esser (RV), Gilbert (RV). 2B: Bindl (M), Graf (M), Hebert. Pitching (ip-h-er-so-bb): Thayer (W; 3-1-0-6-0), Buza (2-1-0-2-0), Balas (L; 5-15-13-3-2). Leading hitters: MID — Bindl 3x4, Williams 2x2, Hebert 2x4. HR: Williams. 2B: Bindl, Graf (M), Hebert, Redders (M). Pitching (ip-h-er-so-bb): Gunter (L: 4-13-11-5-3), Thayer (W; 3-3-1-3-1), Buza (2-0-0-3-0). Leading hitters: MID — Hiorns 3x3, Hebert 3x4, Redders 2x3, Williams 2x3. 3B: Gunter (ME). 2B: Horst (M), Redders, Williams, Mitchell (ME). Pitching (ip-h-er-so-bb): Thayer (L; 6-7-0-5-0), Decker (W; 7-2-0-10-1). Leading hitters: Cox (MM) 2x3. 2B: Williams (M).